The Outlander TV series is the best example of a TV adaptation to a book series in decades. (Maybe since Roots?) Diana Gabaldon’s story of a young, outlaw Highlander and a time-traveling, willful WWII nurse has captured the minds and hearts of millions of fans around the world. If you don’t get STARZ through your cable or satellite service, you can add it very easily to your Amazon Prime membership. That way you can watch all the episodes any time you want. You can also purchase Outlander episodes on Amazon and on iTunes. If you’re a fan of Diana Gabaldon, the author of the Outlander book series, you may be familiar with her story. She didn’t set out to be an author. She actually has a Ph.D. in zoology. She has also been a casual student of history, devouring biographies and journals. She joined a fiction writers group, where she began sharing bits of Outlander. Her fellow writers were so impressed they encouraged her to seek a publisher. Since then, she has published eight Outlander novels, with a ninth on the way. She has also published several short stories, mostly centered on Lord John Grey. (I highly recommend them. John is one of my favorite characters and these stories are just a joy to read.) She has also written short stories that help answer some of the questions she raises in her books, like how the heck Roger is a descendant of [blank] and what happened to his parents. When the book series became a massive success, Hollywood came knocking. Hollywood studios were very interested in adapting Outlander for the big screen. More than once, Diana Gabaldon signed contracts with big studios to see her vision up on the big screen. However, over and over again, the Outlander movie fell into development hell. It was never made (obviously). The next big idea was to make Outlander into a TV mini-series. That certainly seemed like a good idea, because Claire and Jamie’s story could hardly be told in just two hours. But as the months and years rolled on (again), it became obvious that even a TV mini-series wouldn’t do the books justice. Gabaldon reassured her fans that STARZ, and namely executive producer Ronald Moore, knew what they were doing. He had already produced an amazing reboot of Battlestar Galactica. She felt like her story and her characters were in good hands. On August 9, 2014, the Outlander TV series premiered on STARZ to a whopping 3.7 million viewers (live and on demand), making it the biggest premiere in the network’s history. “The Wedding” episode in Season 1 broke another record. “The Wedding” nabbed 2.04 million viewers, the highest for a single episode that wasn’t a premiere. Then the Season 3 premiere, “The Battle Joined,” broke that record again with 2.09 million viewers. Fans had been waiting for more than a year between Season 2 and 3, so no wonder they had their butts on the couch for the season premiere. That was the episode that showed what happened to Jamie and Claire after Culloden and Claire’s return to the 20th Century. Don’t have STARZ? Did you know you can add STARZ to your Amazon Prime membership? You’ll get access to all their shows through Amazon, their apps and their devices, including Fire TV. (I even signed up my mom!) See if adding STARZ to Amazon Prime is right for you. The Outlander series has sold more than 28 million copies, to date. 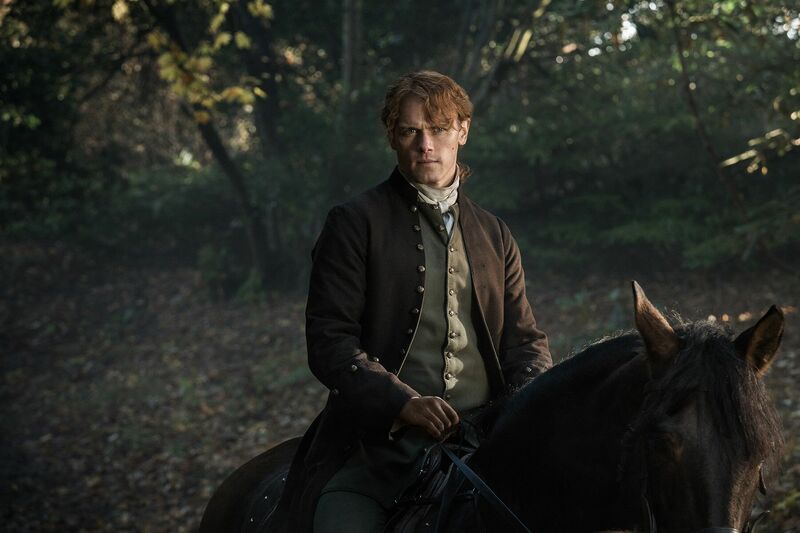 With so many novels, novellas and short stories, we’re sure to see our favorite Highlanders on the small screen for years to come. One of the reasons the TV series is such a success is because the Outlander cast is incredibly talented (and easy on the eyes). However, Balfe has proven herself to be the perfect embodiment of the high-spirited, independent Claire. She quickly became a favorite of the fans, winning the TV Guide Award, along with Sam Heughan, in 2014 for “Favorite Duo.” She then went on to win critical accolades. She has been nominated for a Golden Globe three times. And She won a BAFTA for Best Actress on Television in 2016. The fans didn’t take to Sam Heughan at first, either. (Rabid fans always have very loud opinions about what an actor or actress should look like when they’re cast as their favorite character.) He didn’t seem large enough to play the Jamie Fraser, who is described in the books as a very tall, very broad-shouldered man with especially attractive muscular calves. Again, fans took to Heughan quickly after the first episode. In 2015, he won the IGN People’s Choice Award for Best TV Actor. In 2016, he was nominated for a Critics’ Choice TV Award for Best Actor in a Drama. He was also nominated for a BAFTA in 2016. Tobias Menzies was cast in the roles of Frank Randall and Jack Randall, Frank’s ancestor. He made Frank a sympathetic character when the audience was ready to hate him. And he made Black Jack Randall so evil the audience loved to hate him. Menzies was nominated for a Golden Globe for Best Performance by an Actor in a Supporting Role in a Series in 2016. 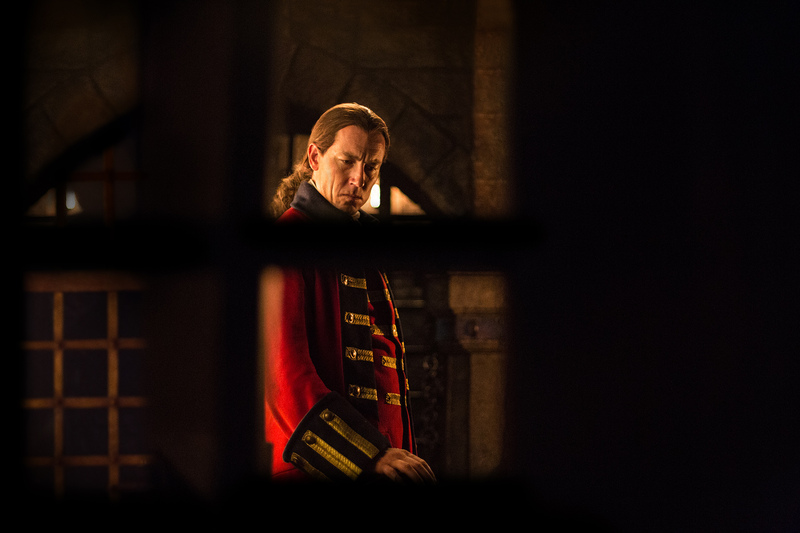 Tobias Menzies as Black Jack Randall in Outlander Season 1. Fans fell in love with other supporting players too: Duncan Lacroix, as Murtagh Fraser, Jamie’s godfather; Grant O’Rourke as Rupert MacKenzie; Graham McTavish as Dougal MacKenzie, Jamie’s uncle; Stephen Walters as Angus; Nell Hudson as Laoghaire MacKenzie; Lotte Verbeek as Geillis Duncan; and Laura Donnelly as Jenny Fraser, Jamie’s sister. 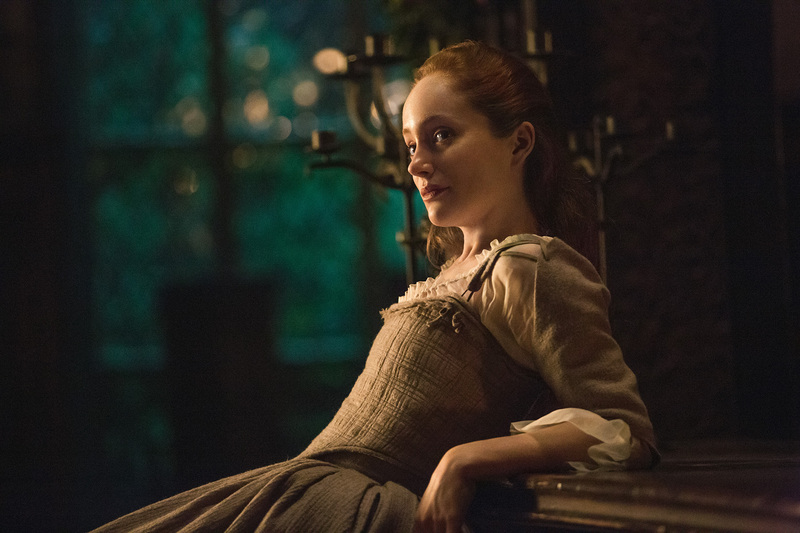 Lotte Verbeek as Geillis Duncan in Outlander Season 1. New actors were introduced in Season 2 and Season 3, notably, César Domboy as a grown-up Fergus; Lauren Lyle as Marsali, Jamie’s stepdaughter; Gary Young as Mr. Willoughby; Dominique Pinon as Master Raymond; Sophie Skelton as Brianna, Claire and Jamie’s daughter; Richard Rankin as Roger Wakefield; and David Berry as Lord John Grey. 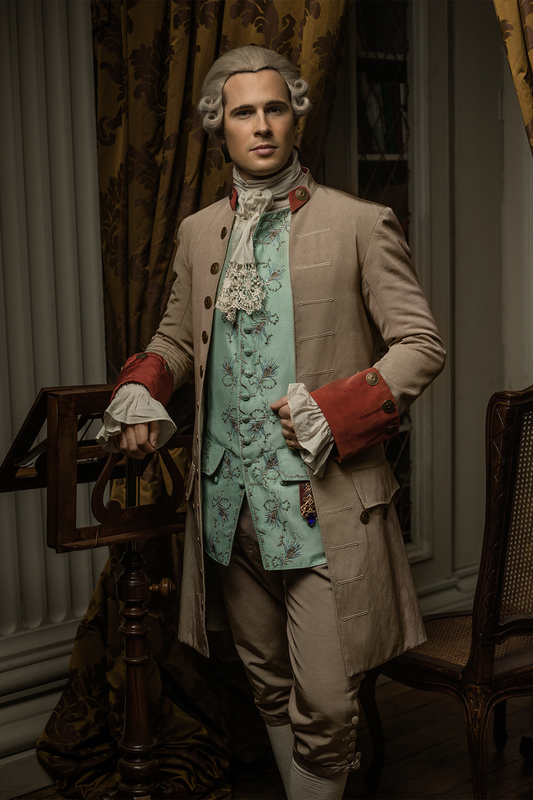 See also: Download my Outlander cheat sheet with cast photos and previous credits. As I mentioned above, Ronald Moore is the executive producer of the Outlander TV series. Fans know and love him almost as much as they do the cast members. He’s been known to wear a kilt to Outlander TV series premieres and press events. Fans are also enamored of the musical duo of Bear McCreary and Raya Yarbrough. McCreary is the TV show’s composer. (I especially love Claire and Jamie’s theme. *sigh*) His wife, Yarbrough, sings the opening theme, “The Skye Boat Song.” It’s an adaptation of the original “Skye Boat Song,” which is about Bonnie Prince Charlie fleeing to the Isle of Skye after the loss at Culloden. Check out the Emmy-nominated soundtracks on Amazon and iTunes. Outlander TV series has made millions of fans around the world long to visit Scotland. As I mentioned, I was lucky enough to take an Outlander tour of Scotland with Celtic Journeys. The Celtic Journeys tour visits some filming locations, but it’s mainly focused on places from the books, or locations that have historical significance and are related to the books. If you are ever lucky enough to take a trip to Scotland (I highly recommend it), here are some of the filming locations you should visit. I also created a Google map of Outlander filming locations that you can add to your own Google account. You wouldn’t think that clothing from the 18th Century would be in high demand. Thanks to the Outlander TV series, it is! Women are looking for shawls, arm warmers (fingerless gloves), skirts and dresses that Claire Fraser would wear. Women are also shopping for kilts for the braw lads (men) in their lives. Here are several places to look for Outlander clothing. Etsy – Independent crafters and artisans have a TON of fantastic Outlander-inspired clothing on Etsy. Click the link to start looking. Entertainment Earth – Entertainment Earth has a rotating stock of a variety of official Outlander apparel. Some of the pieces are no longer available in the official store. Official Outlander Store – This online store is continuously updated with the latest clothes, props and other merchandise from the most recent seasons. What is Droughtlander? It’s that awful, painful time between new episodes of Outlander. The phrase was coined when the first half of Season 1 ended on Sept. 27, 2014, yet new episodes wouldn’t start until April 4, 2015. It was painful, I tell ya! The longest wait, however, was between Season 2 and Season 3, from July 9, 2016 to Sept. 10, 2017. Over a year! What’s a woman to do during Droughtlander? I have two suggestions. #1 Watch other TV shows like Outlander. Well, there’s nothing exactly like Outlander, is there? But these romantic TV dramas that have something in common with Outlander will tide you over. #2 Read Highlander romance novels. Now, technically Outlander isn’t a romance novel. It defies categorization, really. It’s part romance, part historical fiction, part sci fi. But all GOOD. Here’s a list of the best Highlander romance novels and some info on the authors. That’s pretty much everything I know about the Outlander TV series so far. Thanks for reading! How old are you? Best adaptation in decades? Ever heard of game of thrones? Game of thrones season 1 was a great adaptation, but since then it’s deviated from the books quite a bit (even passing the last book written in timeline, as fans know). Outlander has stayed very true to the books, hardly deviating at all from the written text (and usually only in ways so as to advance/improve the narrative, like fleshing out Mr Willoughby). Both are good tv series, I’m a fan of both and both sets of books too, but there’s no doubt that Outlander has stayed more true to its source material.